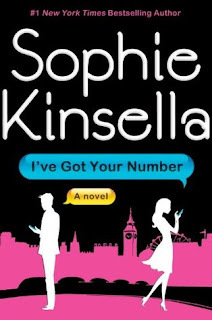 Sophie Kinsella is the woman behind the Shopaholic book series as well as other books about female characters who have at least one screw loose and lie more than necessary. Kinsella's latest book, I've Got Your Number, follows the same strategy. Girl loses her engagement ring, but instead of telling her fiance she lost it she goes through great lengths to cover it up. The lie leads her to taking a phone out of a trash bin that belonged to a former PA of a corporate exec. This chick ends up helping the guy so that he will let her use the phone because her's got stolen. It is a ridiculous mess and I pretty much had the entire story figured out within the first 20 pages. The ending is so outrageous I thought my eyes were not going to come out of the back of my head after I rolled them. Kinsella's stories are all the same. The lead character is always the same girl just doing a different profession with a different mess that she digs herself deeper into. It is quite irritating actually. If you have ever seen the Confessions of a Shopaholic movie with Ilsa Fisher you will see how annoying she is, but for some reason I can get through the books without putting a hole through the wall. Anyways, if you are a fan of Kinsella then you could read this. I have read every book she has ever written and still the first three shopaholic books are the best by far. The non-shop books are usually pretty brutal.